« Platypus and the problem with primitive. As I have explained in various blog posts and in this paper, it is a fallacy to assume that any one character found in a so-called “primitive” species alive today was also found in the ancestral species. All living species are modern species, and “primitive” vs. “derived” refers to characters, not whole species. Anyway, New Scientist seems to have fallen for this in their interpretation of a recent paper. Playing leapfrog would be tricky for the most primitive living frogs: those from the Leiopelmatidae family crash-land rather than touch down gracefully after leaping. The finding may reveal how frog jumping evolved. Richard Essner of Southern Illinois University in Edwardsville suspected unusual jumping behaviours in leiopelmatids because they are known to swim differently from other frogs, using a “trotting” movement rather than a synchronous double kick. Essner’s team used high-speed video to compare jumping in three leiopelmatid species with two more-evolved species. Whereas the more advanced species begin to fold up their hind-limbs in mid-air to prepare for landing and their next leap, “Leiopelmatid frogs don’t fold up their legs until after they’ve hit the ground,” he says. Ascaphus montanus, the most primitive species, kept its legs splayed as it landed in a belly flop or nosedive, then skidded to a halt on its belly. Perhaps it’s no surprise that frogs evolved to jump before they could master landing. The authors of the paper state several times that these frogs retain the ancestral swimming style. Presumably this is backed up with clear evidence in the fossil record, and not just position on the reconstructed phylogeny. Otherwise, there is an obvious alternative interpretation: the swimming mode in leiopelmatids is derived and results in a reduced leaping ability. Given that they are mostly aquatic and have other derived adaptations to life in fast-running streams, this is not at all implausible. Again, these are all modern species that have been evolving for exactly the same amount of time since their split from a common ancestor. 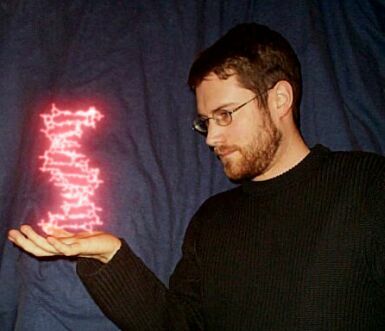 UPDATE: Evolutionary concepts are often superficially simple but in fact very difficult to grasp correctly. This story shows how this extends to both researchers and science writers and, presumably, their readers. New Scientist, Scientific American, Discoblog (Discover), Ed Yong (Discover), the journal (Naturwissenschaften), and the study authors all appear to be confused to some extent about what “primitive” means and how one establishes ancestral vs. derived characteristics. Here’s an example from my paper on evolutionary trees. 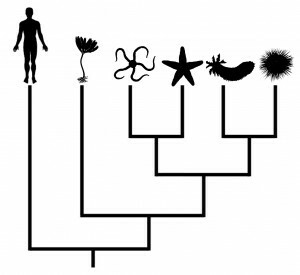 Which is more “primitive”, “early branching”, “least evolved”, or what have you? 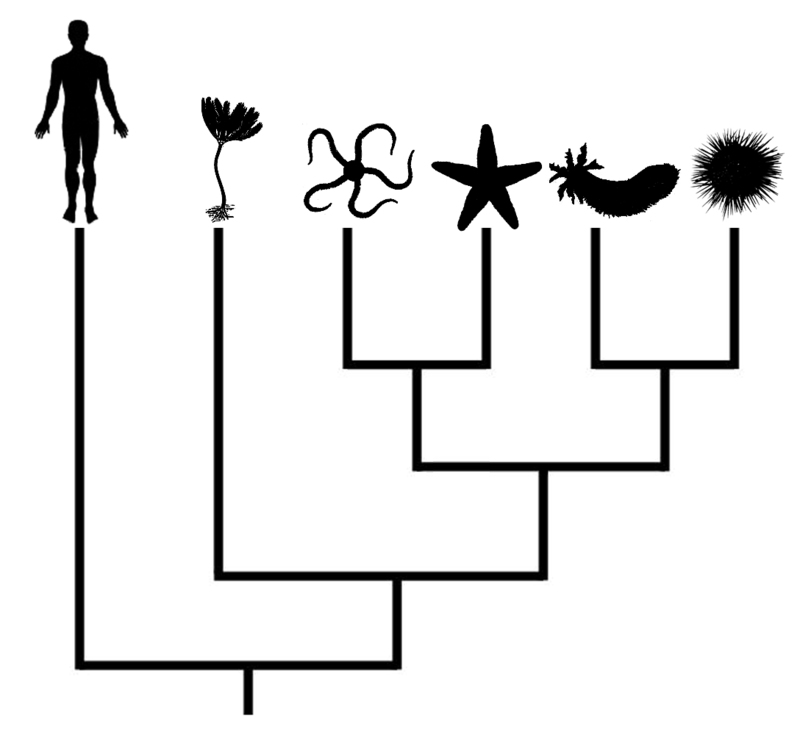 Can you conclude anything about the ancestor of echinoderms and chordates by comparing modern humans vs. modern echinoderms and assuming the early branching lineage is primitive? 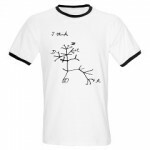 4 comments to Primitive frogs and phylogenetic fallacies. True enough. But even if there were no choice but to use “advanced” (which I am not sure there is), this should still only be used to refer to characters, not species. Vieraella is an extinct genus of frog from the Jurassic period of Argentina, and the oldest true frog known. Despite living around 200 million years ago, Vieraella was anatomically very similar to modern frogs. For example, its hind legs were adapted for jumping, and the skull already possessed the lattice-like form found in modern species. It was, however, an unusually small frog, measuring only 3 centimetres (1.2 in) in length. Although older frog-like creatures are known, such as Triadobatrachus, these possessed many primitive characteristics, and cannot be said to “true” frogs. So, was jumping the ancestral state and this bellyflop a consequence of a derived specialization to moving streams? Scientific American spins the story the same way as NS. I think you can trace this problem to the researchers (who talk about “more derived frogs,” for example) rather than the journalists, although it would be nice if the latter didn’t take the bait.